Javier Nandayapa started his musical career in 1989 with the famous Marimba Nandayapa ensemble, and took part in every concert, and international tour the group carried out until 2011. With this ensemble he made 16 recordings. Since 1992, he offered lectures on Central-American marimba and gave several workshops in different universities in the United States, Europe, Japan and South-America. He started his solo career in 1995 and has traveled 38 countries of Europe, Asia, Middle East, Africa, United States, and the American continent. 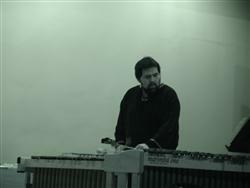 In 1999 he published, with the percussionist Israel Moreno, Metodo didáctico para marimba mexicana ("Didactic method for Mexican marimba"), the first work of its kind in Mexico. He was awarded the State of Mexico Arts and Culture Fund grant in 1999 and 2009 and the National Arts and Culture Fund (FONCA) grant in 1995, 1997, 2001 & 2007. This year, he obtained the “FONCA Scenic Artists with career” 2012-14 grant, with a project that includes more than 60 concerts in Mexico and abroad and three CD recordings with Symphony Orchestra and chamber music. Of the several solo activities of Javier Nandayapa, his participation, in 1998 with Onix, New Ensemble of Mexico at the International Cervantino Festival, in Guanajuato, Mexico stands out, with the performance of Le Marteau sans Maître, by Pierre Boulez. In 2002 he had solo performances at Arizona, Nevada, Northern Kentucky & Missouri Universities, and at the Guatemalan National Conservatory. In May 2003, he participated as soloist at the Fifth Percussion Journeys at Riba-Roja del Turia (Valencia, Spain), and presented a marimba recital at the Cataluña Superior Music School, at Barcelona, Spain. In 2004 the group "Javier Nandayapa trio" offered several showcases at 47th Annual Members Conference of APAP (Association of Performing Arts Presenters), in New York and Between June and July 2004 they presented 10 concerts in Dresden, Plauen, Gorlitz, Taucha and Lichtenstein, Germany at Mexican Festival "Nahualia". He also performed several solo concerts in Felanitx and Palma de Mallorca, Spain; at the second international percussion festival of Patagonia, in General Roca, Argentina and at "Mexican cultural month 2004" in Beirut, Lebanon. In 2006, Javier Nandayapa presented two concerts at “Miguel Angel Asturias” National Theater in Guatemala City and at Municipal Theater in Quetzaltenango, Guatemala C.A. also he realized a 30 concerts tour in Argentina and Uruguay. In 2007 performed with Trio Zur at “Paiz” International festival in Antigua, Guatemala, and with Javier Nandayapa Trio at George Prize Center & Bliss Institute in Belmopan and Belize city, Belize. Between November and December 2007 Javier Nandayapa realized a 11 concerts tour in Brazil, Paraguay, Argentina and Uruguay. In January'08 he presented a clinic and concert at the Third International Percussion Festival in Santiago de Chile, and presented a Recital at the University of Texas in Brownsville. In July '08 he participated at “I Encontro Percussivo” in Recife, Brazil. In 2009, performed at “Le salon du livre” in Paris, France; At the 2nd. Peruvian Cajon International Festival, in Lima, Peru; and the group “Javier Nandayapa Trio” accomplished a tour in Saudi Arabia, Lebanon, Bahrain and United Arab Emirates. He performed with Marimba Nandayapa and as a soloist at the 2010 International Marimba Festival and Conference in Minneapolis, USA. In June’10 the group “Javier Nandayapa Trio” made a concert tour in Kansas city Missouri, USA and in November’10 he performed a concert series in Nairobi, Kenya. Recently the group “Javier Nandayapa Trio” made a concert tour in Orlando Florida and Arlington Virginia, USA. In August 2011, he performed solo concerts at “Alstadtfest” in Görlitz, Germany. In 2012, he participated at “Vibraciones” 2nd. International Marimba and Vibraphone Festival in Lima Peru, accomplished a 15 concert tour and 4 master-classes in Germany, Denmark, Lithuania and Latvia, and performed 10 concerts and 4 clinics in Poland. Recently, he presented three concerts and a clinic at the 3rd. International percussion festival in Costa Rica. He has performed as a soloist with the following Symphony Orchestras: Lithuanian State chamber orchestra, Vilnius Lithuania, Asuncion city's Symphony, Asuncion, Paraguay; San Martin Symphony Orchestra, Instrumentalia Chamber Orchestra of Rosario; Patagonia´s Foundation Chamber Orchestra; National Police Symphonic Band of Argentina. In Mexico, the following orchestras: National Symphony Orchestra of Mexico, Aguascalientes Symphony Orchestra, Queretaro Philarmonic Orchestra, Hidalgo State University Symphony Orchestra, State of Mexico young symphony orchestra, Xalapa chamber orchestra, IPN Symphony, Fine Arts Chamber Orchestra and Veracruz young symphony orchestra. Javier Nandayapa is sponsored by Marimba One & Innovative Percussion, Inc.